The cruise control system allows you to program the vehicle to maintain a constant speed without depressing the accelerator pedal. 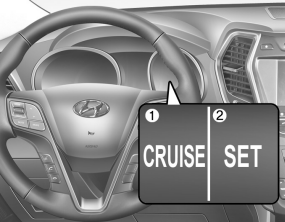 If the cruise control is left on, (CRUISE indicator light in the instrument cluster is illuminated), the cruise control can be switched on accidentally. Keep the cruise control system off (CRUISE indicator light OFF) when the cruise control is not in use, to avoid inadvertently setting a speed. Use the cruise control system only when driving on open highways in good weather. Do not use the cruise control when it may not be safe to keep the vehicle at a constant speed, for instance, driving in heavy or varying traffic, or on slippery (rainy, icy or snowcovered) or winding roads or over 6% up-hill or down-hill roads.